This is going to be a thread series that I decided to start, I think its a good way to generate discussion and create something interesting. Basically I am going to post the squads of many different nations and you could decide who you would take at your club. Here goes - Peru edition first. The likes of Christian Cueva and Andre Carrillo have gotten most attention at this world cup, but the entire right flank has performed well. Luis Advincula another example, while natural talent like Edison Flores and Miguel Trauco underperformed. Then you have Guerrero, who is old but useful. 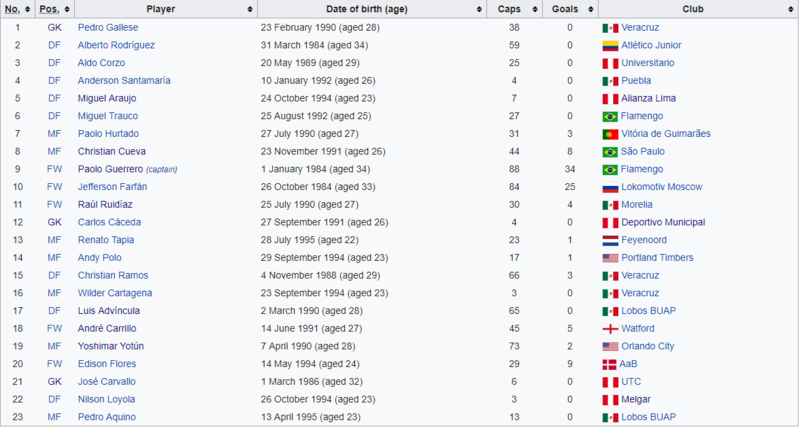 Other players who some could be keen are Ruidiaz (30+ goals in Mexico last 2 years), Miguel Araujo and Paolo Hurtado. Also a thread for Australia currently up. All in all its very difficult to ascertain which players in this case would make the cut to a more competitive environment where their place isn't guaranteed. But with Carrillo at least he is at Watford and things can be studied easier. Carrillo is already a Benfica player (probably not for long), so I would take Cueva. I liked his style and we need a good player for that midfield position. I don't see why he couldn't do well in the Portuguese league. Probably knows a good degree of Portuguese too. Plays in Brazil after all. I wouldn't take any. Nothing against Peru as I'm sure players like Tapia could have an impact at bigger and better clubs. However it takes a certain character to settle in to our club. I'm not talking about brave, charismatic lionhearts. Usually it's players that like RnB and can freestyle. Look at Carrillo. Excellent for us, poor for Watford. I think you make a good point. A lot of our players can cut it at big teams, but I'm not sure about the PL. Tapia would be excellent there, but its a league that I just don't think would suit any of them. Also the language barrier is an issue as not many of them know English. Just Tapia, Corzo and obviously Carrillo.